Is the flu shot responsible for febrile seizure in children? 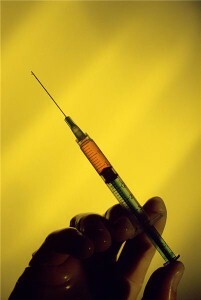 Home » Pregnancy » Fertility » Is the flu shot responsible for febrile seizure in children? The Food and Drug Administration is investigating a possible health hazard posed by a popular flu vaccine after the organization received reports of 42 cases of febrile seizures. The investigation is hoping to determine whether the injection was to blame or if there were other factors involved, Reuters reports. The cases have been reported since December 13, and a spokeswoman for the FDA said that 38 of them occurred within a day after the child got Fluzone, widely used vaccine. Despite the investigation, the Centers for Disease Control still maintains that everyone older than 6 months should receive the flu vaccine every year, as all of children involved recovered and none suffered lasting effects. "At this point no correlation between influenza vaccine and febrile seizures has been established," drug manufacturer Sanofi-Aventis said in a statement. "Adverse events after vaccination may be causally related to vaccine or may be coincidental." According to the CDC, moms and dads should take care during flu season, as youngsters are especially vulnerable to suffering complications associated with the disease, and an average of 20,000 children under the age of 5 are hospitalized each year due to the virus.